I found this new, limited-time-only breakfast burrito to be filling and pretty tasty. 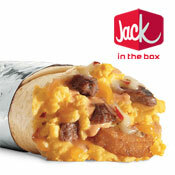 However, I think that Jack In The Box's Sausage or Meat Lovers breakfast burritos are better choices. 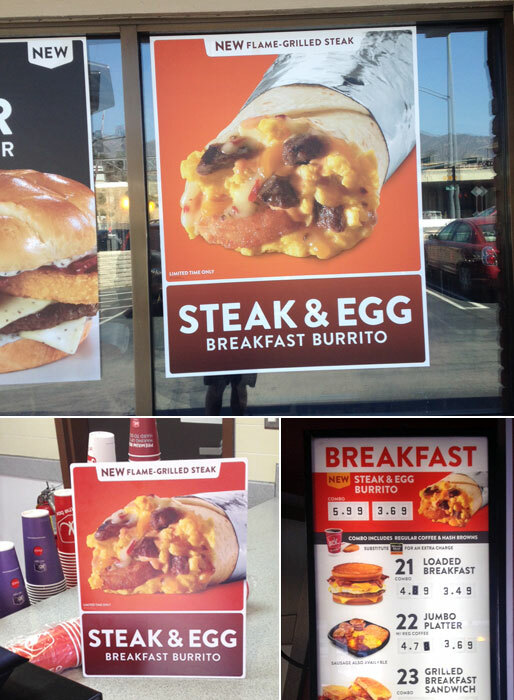 The new Steak & Egg Breakfast Burrito is already spicy without any additional hot sauce. That's due to a creamy Sriracha sauce that infiltrates most bites. You could taste the Cheddar cheese, but I wouldn't call this burrito "cheesy". The Pepper Jack cheese was less noticeable. The hash brown pieces were crispy and gave a mild crunch to every other bite. The eggs were fluffy and completely acceptable. As for the steak... if you try pieces on their own, the meat is flavorful. Unfortunately, that flavor gets lost amongst everything else that's going on. If the steak had more of a smokey, grilled aspect, it might have stood out as much as sausage or bacon do in other burritos. The biggest drawback of this burrito is probably to be expected. Occasionally, you get a piece of steak that's slightly grizzly or stringy. That's just the nature of cheaper cuts of steak. With all that said, I enjoyed this burrito. 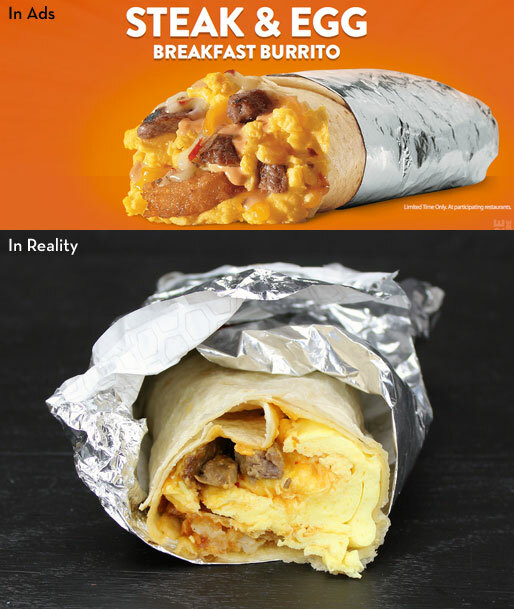 But given the choice, I would choose their Grande Sausage Breakfast Burrito over this product every time. The burrito tested here was prepared at the Jack In The Box on San Fernando Blvd. in Burbank, CA. What do you think of Steak & Egg Breakfast Burrito? It never said anything about all the hot spices on the menu board, one bite and I am in trouble, never again. Taking this back! Correct the menu board. HOT and SPICY. 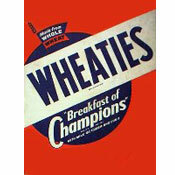 They brought it back and then got rid of it again, what a bummer. I ordered it minus their sriracha sauce and added their salsa instead, it was good stuff. Best thing on their menu besides the bacon cheddar potato wedges.